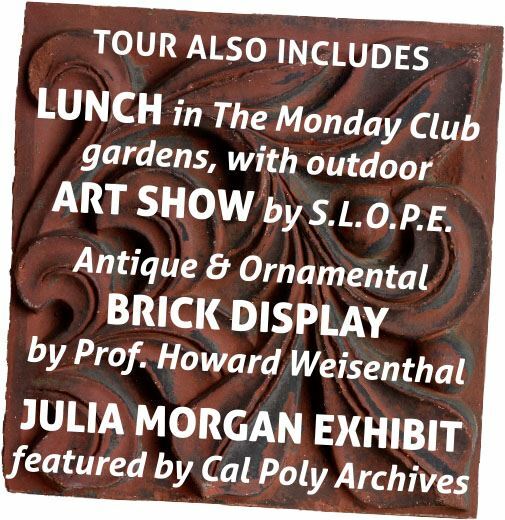 The theme of our 2016 Tour is Architectural Masonry, and the 9 sites we’re featuring include buildings made of San Luis Obispo brick, clinker bricks, and granite from Bishop’s Peak and Caen quarries. Tickets will be sold in advance and at SLO Consignment (1599 Monterey St., San Luis Obispo) or online at Brown Paper Tickets (BPT). Credit Cards accepted at SLO Consignment or BPT. Tickets may be purchased at the door for based on availability. Tours are self guided and begin at The Monday Club. If you select the afternoon tour, please consider enjoying lunch in the garden first. Thank you!